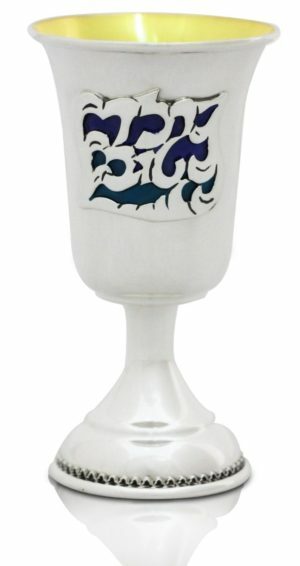 Sterling silver rounded Kiddush cup with a chic twist. Hand carved branches twist around the stem of the cup as leaves and grape vines grow out of the stem, holding up the bowl of the Kiddush cup. Watch the light of the Shabbat candles glisten and dance on the smooth silver, and glimmer through the gold interior, which ensures that the taste and quality of the wine are perfectly retained. The cup rests on a sterling silver plate with three decorative leaves along the rim, elegantly tying the entire design together. Hand-wash with sponge and water only.